The ETP V5 suite provides a complete solution for both the Franchisor and the Franchisee business models from a private label/principal’s point of view as well as a Master Franchisee/Franchisee’s point of view. 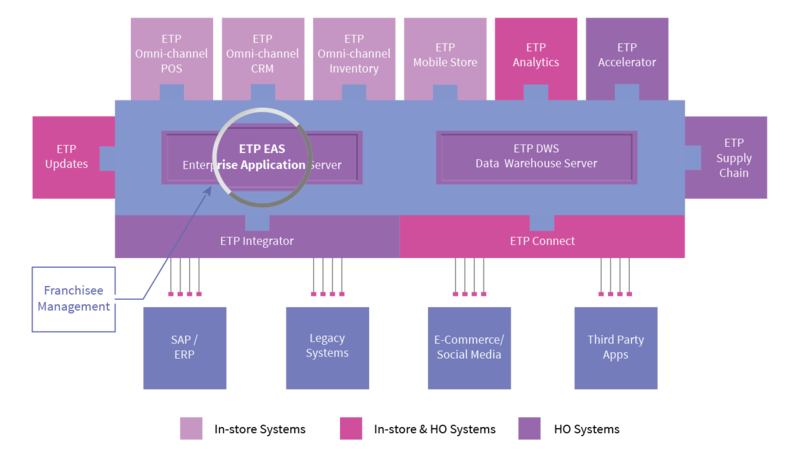 The ETP Store solution helps retailers provide a unified sales management, customer relationship management, inventory management and retail shop floor management platform in a multi-location and a multi-concept scenario. For franchisee stores, ETP Store Operations covers some key business processes at the store level in the form of franchisee purchase receipts, returns, tax handling, transfers, stock check across locations, and handling of periodic stock-take. The concepts of establishing a common sales process and an anywhere returns process using ETP Store is an important deliverable of the Franchisee Management function. ETP Store and ETP Accelerator provide a seamless planning and implementation of common promotions across own stores and the franchisee store network. Business rules for promotions are all defined centrally by the principal and implemented almost instantly across the franchisee store network. Customer driven promotions, category based promotions and even employee discounts can be handled seamlessly without any manual intervention at the store level, thus leading to a higher amount of financial integrity and control, both for the principal and for the franchisee.